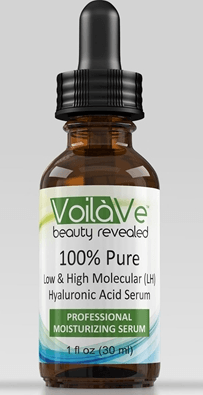 What does the VoilaVe 100% Pure Hyaluronic Acid Serum do? This hyaluronic with vitamin C serum is said to be a face lift in a bottle, giving your skin a more youthful and radiant glow and plumbing up your skin, and reducing fine lines and wrinkles. 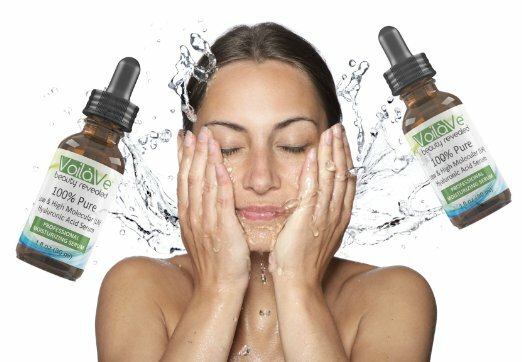 The formulation of both high and low hyaluronic acid means that this serum penetrates your skin much more deeply than other serums, restoring water loss, plumping the skin and increasing elasticity from underneath the skin, as well as protecting from further moisture loss and nourishing your skin from the surface. This serum is a powerful moisturizer and reduces not only fine lines and wrinkles, but also skin discolorations and dark circles around the eyes. It provides an intense level of hydration. Brings definition back to your skin. Reduces the appearance of dark circles and puffiness under the eyes. Contains both high and low molecular weight hyaluronic acid. Twice the moisture of other serums. Fragrance-free and contains no fillers, parabens, or alcohol. Made here in the USA in an advanced FDA-certified facility. Who should use the VoilaVe Hyaluronic Acid Serum? If you have fine lines and wrinkles or even deeper wrinkles, blotchy skin, uneven skin tones, dry patches of skin, dark circles under your eyes, puffy eyes or a dull sallow appearance to your skin, then this VoilaVe serum will dramatically improve the look and feel of your skin. 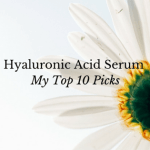 How do you use Hyaluronic Acid C Serum? Apply a thin layer of the VoilaVe serum to your face after cleansing. Use a moisturizer, once the serum is dry, and makeup if desired. You may see results on the first day, but give it at least 30 days to see the best results. This serum does not contain any fillers, parabens, alcohol or fragrances. It is suitable for vegans and is made in the USA in A FDA certified facility. The ingredients of this facial serum are as follows: Purified Water (Aqua), Hyaluronic Acid High Molecular Weight, Hyaluronic Acid Low Molecular Weight, Phenoxyethanol, Ethylhexylglycerin. What does hyaluronic acid do? Hyaluronic acid is a powerful hydrator, absorbing more than 1000 times its weight in water. We naturally produce hyaluronic acid in our body and it is one reason for the fabulous look and feel to a baby’s skin. The problem is that as we age, the production of hyaluronic acid dramatically reduces, so that over time our skin becomes drier, less supple and coarser looking. Hyaluronic acid helps to rehydrate our skin giving it a smoother and more youthful appearance with less lines and wrinkles. The combination of both high and low molecular hyaluronic acids in this serum gives your skin an added boost. This boost comes from the high molecular weight hyaluronic acid which deeply penetrates your skin, re-hydrating your skin and plumping it up from below the surface. This helps to restore firmness and elasticity to the skin, whereas the low molecular weight hyaluronic acid (the formula most common in other serums) does not penetrate the skin so much, but it does nourish, hydrate and brighten the surface skin. 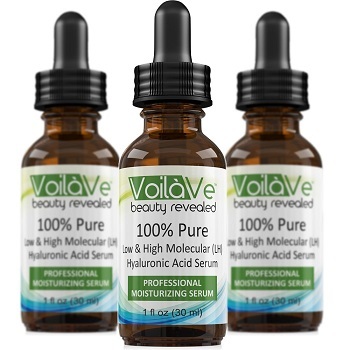 PROS: With more than 90% of customer reviews giving this VoilaVe hyaluronic with vitamin C serum a 4 or 5 star rating, this serum has a serious following of very happy customers. The positives were that this serum rapidly dissolves into the skin and reduces fine lines and wrinkles in a few weeks or less. Their skin was softer with a much more even tone, brighter and smoother. CONS: Only a few reviewers have left a single star rating and these were because they either saw no difference in their skin after using this VoilaVe serum or it was too greasy and they had break outs. This VoilaVe Low & High Hyaluronic Serum will be in my beauty arsenal for a long time to come!! I absolutely love this product! Since using it my skin feels softer, the texture looks smoother and firmer with a radiant glow. I love this product! It plumps up my skin and keeps it moist all day long. Will continue to use this with 100% Organic Argan Oil. I use it in addition to the same brand’s vitamin c and top it off with a moisturizer. It’s a nice alternative to the pricier brand I used to use. Does the VoilaVe Hyaluronic Acid Serum work? The VoilaVe Hyaluronic Serum is 100% pure and does not contain any fillers. With its two different formulations of hyaluronic acid, this serum provides intense hydration from both deep within the skin and on the surface layers. The majority of reviewers (92%) gave this facial serum top ratings, however there were a fair number of requested reviews. You do seem to need to wait about 30 days to see any reasonable results from this serum, but the vast majority of reviewers on Amazon commented that their skin was much more moisturized, more supple and more youthful looking since using this hyaluronic acid serum. VoilaVe offer a 365 day money back, no questions asked guarantee on this serum. VoilaVe also have a Triple Action Vitamin C Serum + Hyaluronic Acid Serum, which they recommend you use with this product. Read about my top 10 picks here.